A Return to Tibet for the Dalai Lama? Rumors are once again circulating of a possible return for Tibet’s spiritual leader. There has been quite a bit of movement between the Chinese government and the exiled Dalai Lama in the past two weeks. The maneuvering by both sides has not quite begun to add up to a logical conclusion, as they each seek to find a peaceful conclusion to the decades-old problem without losing ground. The Chinese leadership under President Xi Jinping not only has the upper hand, but through a mixture of massive infrastructure investment, immigration of ethnic Chinese, and a strong security apparatus may now feel secure enough to negotiate a possible return for the 14th Dalai Lama; one that might actually help diffuse Tibet’s heightened tensions since 2008 and make it a more peaceful, secure buffer zone for China. The exiled spiritual leader of Tibet sent a shot across China’s bow earlier this month when he indicated that he might become the last of his line, telling the German newspaper Welt am Sonntag that “Tibetan Buddhism is not dependent on one individual. We have a very good organisational structure with highly trained monks and scholars.” China then put itself in the awkward situation of having to defend Tibetan Buddhist spirituality, saying through its foreign ministry spokesman that “The title of Dalai Lama is conferred by the central government, which has hundreds of years of history. 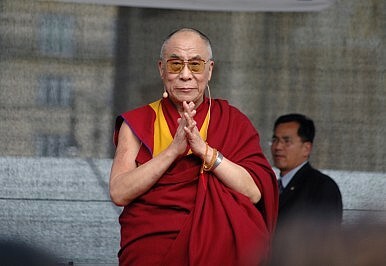 The 14th Dalai Lama has ulterior motives… which is damaging to the normal order of Tibetan Buddhism.” The ability to decide who will be the next Dalai Lama is incredibly important, as it could mean the continued existence of threat to China’s sovereignty beyond its borders, or possibly the end of the issue if China were able to influence the selection. These negotiations are still very much in an early phase, yet they suggest the Chinese government feels increasingly comfortable with its position and hold on power, particularly in Tibet. After Xi successfully brought down former Politburo Standing Committee member Zhou Yongkang this summer, he may feel he has the political bandwidth to negotiate with the Dalai Lama. As an aside, apparently Xi’s father thought well enough of the Dalai Lama, an opinion that was reciprocated. If his ultimate return, or even just a visit, doesn’t eventuate, the illusion of having considered such a thing will give the CPC a helpful public relations bump. Indeed, the Sina post goes on to say that the deal would “instantly destroy” the Tibetan government in exile, take away “a pretext to attack China” by the West, while providing “a chance for Secretary Xi to rack up many victories with one move.” Leaking news of a potential visit before it appears likely shows that China is attempting to put itself in the driver’s seat before the Dalai Lama can frame the issue. A closer look at the current complicated situation of China's political and legal system.